Enter Dad to Win an Amazon Gift Card! Nominate a father to win a $50 Amazon Gift Card when you recycle at a Cohen Recycling Center between June 11 and June 23, 2018. Supply a name, email address, and phone number at the cashier's window to place your nominee in a random drawing for a gift card. One winner will be randomly drawn from the eligible entries at each Cohen Recycling Center. Employees and immediate family of employees of Cohen are not eligible. Customer must bring material to be recycled in order to submit a nomination. Customer can nominate more than one entrant throughout the course of the contest, but not more than one per day. Accepting entries only during business hours from June 11 through June 23. Please consult the Find a Location page to confirm the hours of your nearest Cohen Recycling Center. Winners will be contacted by phone and/or email within one week of the contest closing day and have until July 31, 2018 to pick up their prize. Color In & Win. The Cohen Kids Coloring Contest is Back! It’s official: Fiona the Hippo was voted Best Cincinnatian in CityBeat’s annual Best of Cincinnati© Readers’ Poll. And if you’ve got Fiona fans in the family, here’s their chance to show their love in the Cohen Kids Coloring Contest. Download the PDF, then print out and color in the image of Fiona. If you take your submission to your local Cohen Recycling Center before Earth Day (April 22), you’ll be entered to win the grand prize: a family pass to the Cincinnati Zoo! The Coloring Contest is open to students grades K-5 who live, attend school or church within 25 miles of a Cohen Recycling Center. Entry must have contestant’s name, age, and location (nearest Cohen yard or name of school) to be considered. A grand prize winner will be chosen from all entries. In addition to a grand prize winner, each Recycling Center will also select a local winner to receive a $50 gift card. The deadline for entries is Saturday, April 21. Be creative! Have fun with the recycling and Earth Day theme. Cohen broke ground last week on a 110,000 sq. ft. e-waste recycling facility. The expansion will house a new processing system that increases production capacity by eight times. 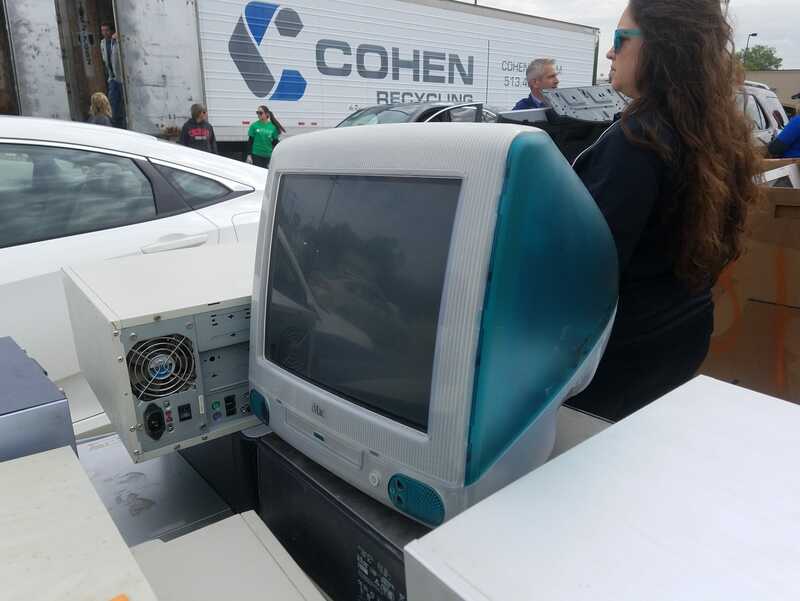 Cohen Electronics, a subsidiary of Cohen Holdings, is a highly certified IT asset management and electronics recycling company whose vision is to provide opportunity to recycle safely, conveniently, and responsibly. "The 50,000 sq. ft. addition and $7 million dollar investment reflects our commitment to provide the communities we serve a cleaner more sustainable environment," said Adam Dumes, Vice President of Cohen Electronics. Processing more than 20,000 lbs. of e-waste per hour, this advanced technology will not only reduce recyclable material going to landfill, but will also more effectively reclaim raw materials for market consumption. And it will add new jobs to the facility and region. "Congratulations to Cohen Recycling, Green Umbrella member business, for building the largest, most innovative facility for recycling e-waste in our region. This success helps to advance our goal of having Greater Cincinnati recognized as one of the most sustainable regions in the country by 2020" said Kristin Weiss, Executive Director of Green Umbrella. "This is a great victory for the tri-state, but it is also a victory for everyone that supports sustainability and human health interests worldwide. We are so proud to contribute to that vital cause by properly handling and processing toxic e-waste" said Dumes. The official groundbreaking ceremony will take place at 10:00 AM on the 26th at 3120 S. Verity Parkway, Middletown Ohio. The Warren County Board of Developmental Disabilities (WCBDD) has recently partnered with Cohen to place individuals with developmental disabilities into skilled labor employment positions. Our very own Wilbur Cohen is honored for a lifetime of giving back to his community, his company and his family. The Cohen family is thrilled to support the LifeSpan school based services program to help curb teen suicide. At Cohen, we're continuing to evolve to better meet the needs of our community by adding more recycling capabilities and processes.